In the early days of colonization, the Portuguese, French and Dutch fought over the territory. Later, Paraiba played a significant role in political movements like the Revoluҫão Pernambucana (1817) and the Confederation of the Equator (1824), in which the Carmelite Joaquim do Amor Divino, known as Frei Caneca, played an important role. In the 20th century, the assassination of governor João Pessoa, in Recife, ignited the 1930 revolution that ultimately turned Brazil into a populist dictatorship. Vestiges of these historical events are everywhere - starting with the capital's name. João Pessoa is one of the major tourist destinations in the state, and visitors flock here to see some of the country's most important architectural monuments, like the Redenҫão Palace (1586) and the São Francisco Church (1589). The region is also known for an important geographic feature: Ponta do Seixas, in João Pessoa, greets the dawn each morning as the easternmost tip of the South American continent. João Pessoa's lovely beaches are just a few of this coastline's many unforgettable landscapes of white sand, green seas, and coconut groves. In the developed state interior, Campina Grande's São João celebrations are the most popular in the country. The same region is home to other extraordinary attractions: the archeological site at Ingá, where stone inscriptions may be 25,000 years old, and the Vale dos Dinossauros (Dinosaur Valley), in Sousa, where researchers found a 50-meter (164-foot) stretch of dinosaur tracks, the longest such footprints in the world. 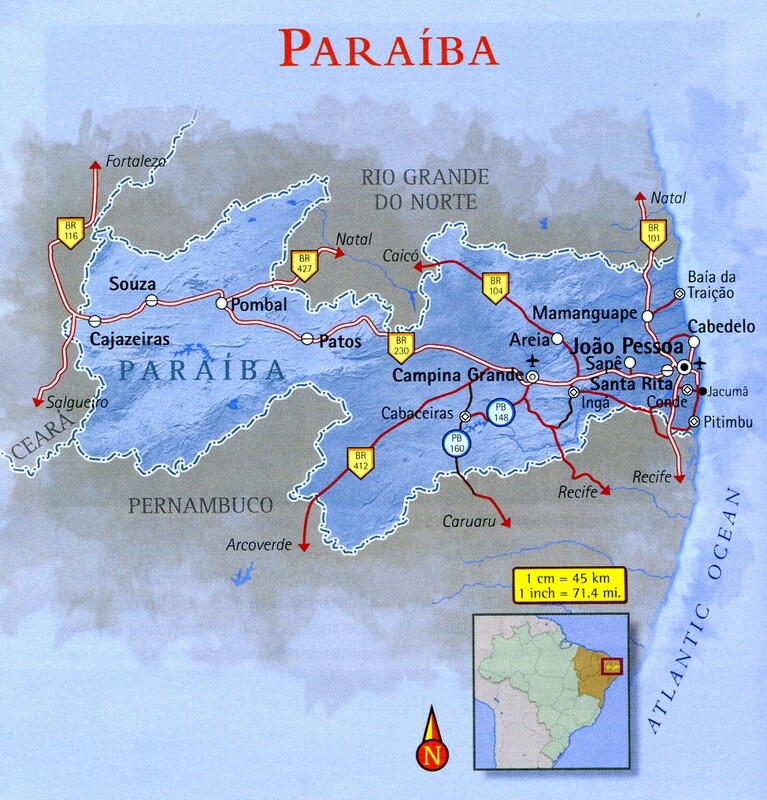 Paraíba (Tupi: pa'ra a'íba: "bad to navigation"; Brazilian Portuguese pronunciation: ([paɾaˈiba]) is a state of Brazil. It is located in the Brazilian Northeast, and is bordered by Rio Grande do Norte to the north, Ceará to the west, Pernambuco to the south and the Atlantic Ocean to the east. 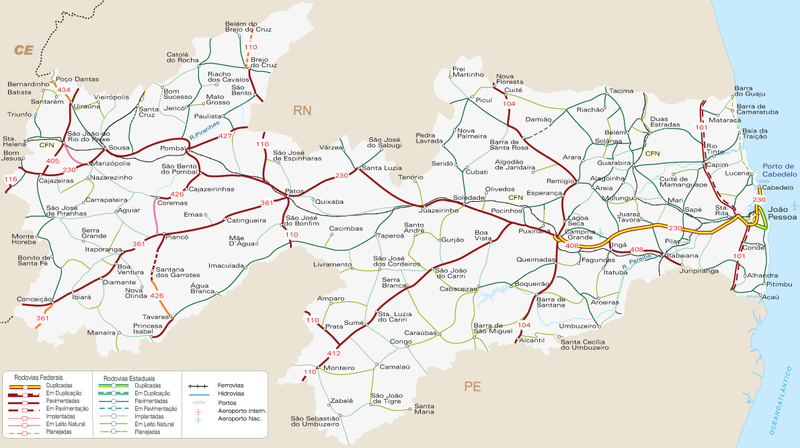 Paraíba is the third most densely populated state of the Northeast; João Pessoa, the sea-bordered state capital, and Campina Grande, in the interior, rank among the fifteen-largest municipalities in the Northeast of Brazil. Paraíba is most populated along the Atlantic coast, which extends as far as Ponta do Seixas, the easternmost point of the Americas. The state is a touristic and industrial hotspot; it is known for its cultural heritage, amenable climate and geographical features, ranging from the seaside beaches to the Borborema Plateau. It is named after the Paraíba river. Some of the most notable Brazilian writers and poets are from Paraíba like Augusto dos Anjos, José Américo de Almeida, José Lins do Rego and Pedro Américo, the last being also known for his historical paintings. In the mid-16th century, Portuguese settlers from Pernambuco founded Filipéia de Nossa Senhora das Neves (today João Pessoa) at the mouth of the Paraíba do Norte River. The area soon proved perfect for sugar production, with the French, the Dutch and the Portuguese all constantly fighting to control the Paraíba region to grow the lucrative sugarcane in. The fortress of Santa Catarina, near João Pessoa, was built to protect the city from the Dutch, who soon became a threat to Portuguese supremacy in Brazil. In late 1989 a team led by gemstone prospector Heitor Dimas Barbosa uncovered in a small mountain range what some consider to be the finest tourmaline crystals ever found. A trace of copper gives the tourmalines a vivid turquoise color that had never been seen before in the gems, and is sometimes referred to as "neon". The "neon" paraiba tourmaline, a vivid blue and blue green, has also been found in other deposits close to the Batalha mine of Barbosa, and also in the neighboring state of Rio Grande do Norte. The bright colors of this tourmaline are due to the presence of copper. Around 2000, a similar copper-containing tourmaline was found in Nigeria, although the colors are not as intense. Around 2005, beautiful crystals of copper-containing tourmaline were found in Mozambique. Initially, the nomenclature for this tourmaline was "Paraíba tourmaline". Note the capitalization and the accent on the "i". In 2006, the LMHC (Laboratory Manual Harmonization Committee) agreed that "paraiba" should refer to a variety of tourmaline, and not indicate a geographic origin. Note "paraiba" is not capitalized, and does not have an accent on the "i". For more information on paraiba tourmaline, see article on tourmaline. The term "paraiba tourmaline" may now refer to gems found in Brazil, Nigeria, and Mozambique that contain copper and have the characteristic blue-green color. • The urban beaches and hjstorical buildings of João Pessoa. • The easternmost point in Sourh America - the Cabo Branco Lighthouse at Ponta do Seixas, in João Pessoa. • The beaches and manatees at the Unesco Biosphere Reserve, Barra de Mamanguape. • The granite expanse and boulders of Lajedo de Pai Mateus, in Cabaceiras, was the setting of the film Tile The Dog´s Will (O Auto da Compadecida). • The prehistoric relics in the villages of Ingá and Sousa. • In the busy summer (December to February), or in the low season if you want to relax in João Pessoa when it's quieter. • Any time of year for the coast and inland towns like Areia, except during the rainy season, between May and July. Inland, in Cabaceiras, the sun shines year-round. • During Carnival, visit a lively place Iike Jacumã, on the south coast. • In June, sample some of the wildest festivities in Brazil, here in Campina Grande. • Between July and December, in the dry season, for best viewing of the dinosaur tracks at Soma village.